On June 2, 2016, Thai authorities raided Wat Pha Luang Ta Bua Yanasampanno, a Buddhist temple also known simply as the Tiger Temple. There, in a temple freezer, they made a shocking discovery. These discoveries confirmed that the tourist attraction was actually a front for rampant animal abuse. 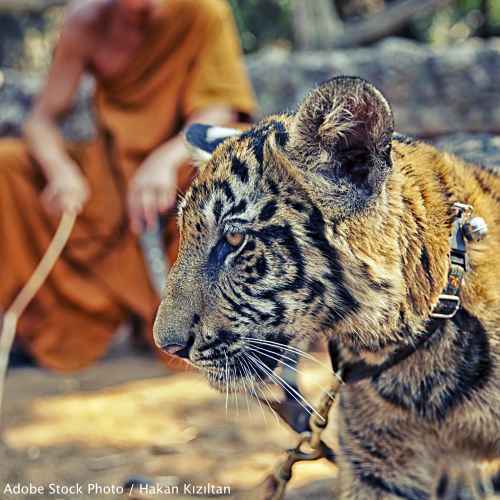 The list of organizations opposing the Tiger Temple is long, and their complaints widespread. Convention on International Trade in Endangered Species (CITES) prohibits the commercial breeding of tigers. The temple lacks accredited conservation breeding programs and proper facilities to humanely house these animals. It has engaged in unauthorized trade of tigers with Laos. And now, animal trafficking must be added to their list of crimes. In the wake of the discovery of the deceased tiger cubs and parts, all 137 tigers held by the Tiger Temple were removed from the premises. But the loss of the tigers is estimated to cost the temple $3 million each year in ticket sales to unsuspecting tourists. Now the Temple is fighting back. In 2015, the temple created a company called Tiger Temple Company Ltd., applied for, and was granted a zoo license. This license would permit the company to buy back the seized tigers and legally breed them. Thailand's Department of National Parks, Wildlife and Plant Conservation has stated that because no one from the new company has been convicted of a serious crime, there was no legal justification to reject the application. But the Tiger Temple's legacy of abuse and trafficking cannot be ignored. Tell Thailand's Department of National Parks, Wildlife and Plant Conservation that Tiger Temple Company Ltd.'s zoo license must be revoked and that the temple's 137 seized tigers should instead live out their lives in a sanctuary free from those who would treat these beautiful cats as entertainment or commodities! The following video by National Geographic provides a comprehensive look at the history of the Tiger Temple and some of their past animal rights violations. It was made months before Thai authorities seized the cats from the temple. While informative, please be warned the video contains some graphic imagery of dead tigers. I am writing to ask your collaboration in revoking the zoo license for Tiger Temple Company Ltd. While no one in the company has yet been charged with the abuse or trafficking of tigers, the ties to the original Tiger Temple, where abuse and trafficking have been rampant, are undeniable. To sell the tigers bravely seized during your raid on the Temple would condemn these endangered animals to generations of potential abuse and trafficking. Tigers are neither for entertainment nor profit. They are not commodities or livestock. They are majestic, wild animals. The Thai government has already taken the first step in protecting these tigers by removing them from the Tiger Temple. Now, their fates rest in your hands. Please, continue your legacy of fighting for tiger welfare by revoking Tiger Temple Company Ltd.'s zoo license and ensuring that the Temple's tigers live out the rest of their days in a sanctuary free from those who would treat these beautiful cats as entertainment or commodities! That's 8,594 signatures! Let's keep the ball rolling.